February 11, 2011 - On Thursday, Manx2, a commuter airliner, Flight 7100, of the UK had departed at 8:12 AM local time, from George Best Belfast City Airport, Ireland to Cork Airport, Ireland with 10 passengers and 2 crew members. Just after 9:30 AM local time, the Metroliner SW4 aircraft cashed under heavy fog killing 6 onboard. Eyewitnesses at the airport stated that the fog was so thick that they could not see the crashed aircraft. The injured were taken to Cork University Hospital for treatment. Two were described as having serious injuries and two were able two walk away from the crashed aircraft. Manx2 Airline is a commuter airline, based in the Isle of Man. It sells flights and services from several airports in the UK and Ireland with bases in Belfast City, Blackpool, Cardiff and Isle of Man. The flights are operated by a number of airlines including VanAir Europe and Jetstream Executive. Irish Aviation Authority (IAA) a commercial state-sponsored company which provides air navigation services in Irish-controlled airspace and regulates safety standards reported Flight Avia Flight NM7100, a Metroliner SW4, with ten passengers and two crew members has crashed at Cork Airport. The aircraft made its first approach at Cork Airport to Runway 17 in low visibility conditions (Category 2). The aircraft did a go-around and attempted a second landing on Runway 35 hover this pilot did a missed approach and attempted a third approach for runway 17. On this approach, to Runway 17 the aircraft crashed adjacent to Taxiway C. This aircraft broke up into two pieces and caught on fire. Debris was scattered onto the runway and over a wide area. This cash is being investigated by the Air Accident Unit of the Department of Transport. ?This has been a terrible day and our thoughts are, first and foremost, with the families of those who lost their lives, and those who were injured. We need to establish what happened this morning, and we will continue to work with the authorities throughout their investigation. 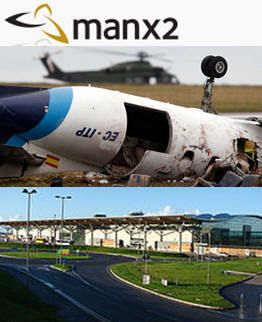 Members from my team have been in Cork to liaise with the relevant authorities, said Noel Hayes, Chairman of Manx2. ?Manx2.com has never experienced anything like this in our five year history and the tragedy has been a terrible shock to us all. We extend our deepest sympathy to the families of those who lost their lives, and we hope that the people who were injured make a full recovery. I also want to pay tribute to the emergency services in Cork, who were extremely quick and professional in their response. In addition we are very grateful for the support provided by Cork Airport & Belfast City Airport. We will continue to do everything we can to help those affected in any way by this tragedy.? The crashed aircraft was a Fairchild Swearingen Metroliner, c/n BC-789B, registration EC-ITP. The aircraft was owned by Flightline BCN, based in Barcelona, Spain. The aircraft was 19 years old at the time of the accident.